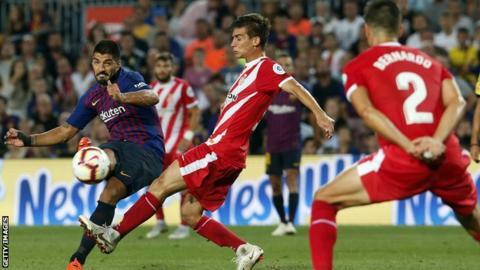 US football fans are being asked to sign a petition to show their support for the plan to play Girona's home league game against Barcelona in Miami. Fifa has said it is opposed to the idea, while the Spanish Football Association and Spanish players' union (AFE) have also objected to the game. The match in January, proposed by La Liga, would be the first regular-season European club game held in the US. The #BringUStheGame campaign says there have been false claims about the match. The petition, started by La Liga North America, says: "Imagine watching Luis Suarez, Philippe Coutinho, Cristhian Stuani, Portu and others competing right here at home. A real league match, with points on the line. "There's only one problem. Some of the key decision-makers are falsely claiming it won't be good for the game in the US. So we, the fans, need to fight for this match by telling them. The more support we have, the harder we'll be to ignore." La Liga, Spain's top division, agreed to play one game a season in the US as part of a 15-year deal with media company Relevent. Catalan neighbours Girona and Barcelona agreed to move their game to the Hard Rock Stadium on 26 January. The move cannot go ahead without the approval of the Spanish FA, Fifa, US Soccer and the Confederation of North, Central American and Caribbean Association Football (Concacaf). La Liga has told BBC Sport it will go to the Court of Arbitration for Sport if Fifa blocks the move. Football's world governing body has not yet formally banned the proposal.